This Chinese war game is set during the period of the Han Dynasty which ruled what is now modern day China for four hundred years between 206BCE and 220CE. 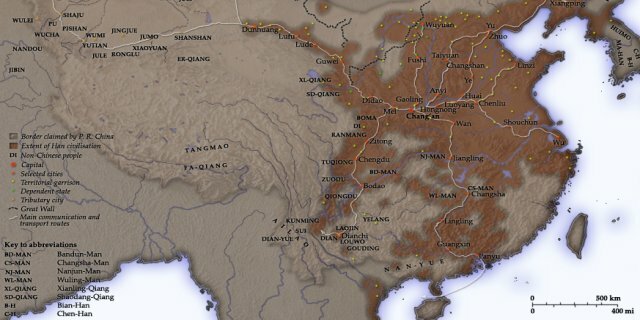 Although this period is seen by many as a golden period, this game is set towards the end of the empire at a time when the sons of the emperor were anxious to secure the crown and glory but they also had to face competing warlords who were also keen to enrich themselves and size power. The dynasty came to an end during the rule of its last emperor Emperor Xian who was forced to abdicate and ignoring his son Liu Bei, an east Han dynasty warlord, took control and went on to found the Shu Han state and become its first ruler. The instructions in the Chinese war game are given in the game and in many ways its a bit like Risk. You choose which warlord you want to be and decide which parts of the Han empire you wish to invade and start a war! After you've played this Chinese war game why not check out and play some f our other online war games? Be a Chinese sniper fighting the Imperial Japanese Army as they lay siege to Marco Polo Bridge. Lead your troops into battle against the Persian army in a quest to extend your empire eastwards. In this strategy war game plan battles to absorb your neighbours and enemies into your Mongol Empire. This war game is set during the rule of the founder of the Timurid Empire in Persia in the 14th century.